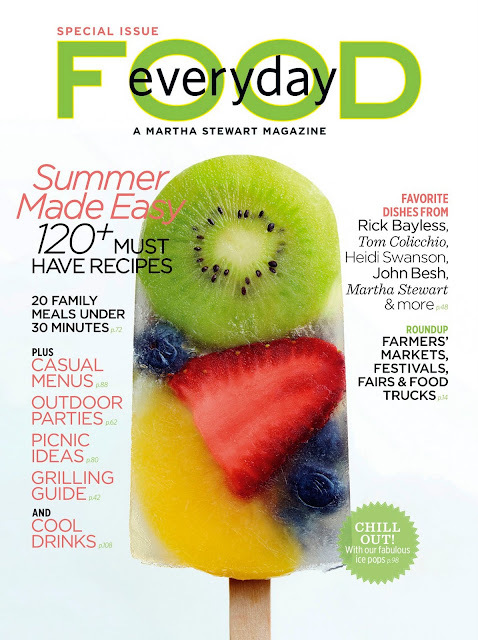 For the first time ever, Everyday Food will publish a full-size magazine for a special summer issue devoted to the best the season has to offer. It is on newsstands today. Find over 120 quick and delicious recipies for summer standouts, like peach pie and fruity pops, grilled chicken, sticky ribs, burgers, slaw, and potato salad. Plus, summer is made easy with 20 dinners in under 30 minutes, a grilling guide, farmers' market tips, recipes from celebrity chefs (including Martha's summer favourites), outdoor party menus, picnics, and more. Surely one for the collectors!